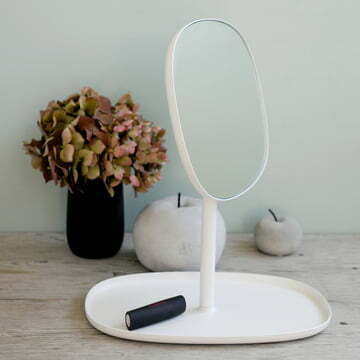 Get the rotatable mirror from Normann Copenhagen now. There are only a few items that are as mystical and fascinating as the mirror. Ever since walking the earth the human being has the need to observe itself. Therefore, the first mirrors were pools of dark, still water, because there was a cult about jewelry in the stone age already. The ancient Egyptians made their mirrors of polished bronze or copper plates. In the 14th century mirrors emerged for the first time, giving blown glass spheres a metal alloy while they were still hot. Towards the end of the Middle Ages, a process was developed in which paper was covered with mercury, mounted with polished tin foil, and covered with another smooth sheet of paper. Afterwards, a glass plate was placed on it and slightly pressed down while the upper layer of the paper was removed again. Today aluminum foil under vacuum pressure is put on smooth glass panels or glass panels are coated with aluminum. Small rooms don’t automatically ask for small furnishings. Especially with mirrors, it’s the opposite case. A great wall mirror or standing mirror reflects the light and makes the room visually larger. The No Frame Square by Driade is designed by designer Antonia Astori for the Driade Kosmo Collection. If you have little room, usually items that have multiple functions help a lot. The Push by Skagerak is such an object. It combines the functions of a clothes stand with a full-length mirror. Hallway: Do hat and scarf fit well? Is the hairstyle still the way you styled it a few minutes ago? Before leaving the house or apartment a last check-up in the entryway is usually compulsory. Therefore, only few people want to do without a hallway mirror. The mirror box by Konstantin Slawinski links mirrors and decorative shelf in a straightforward and modern way. Bathroom: A bathroom without bathroom mirror is hard to imagine. This is where we style and shave ourselves. The Strap design mirror by Hay creates an optical highlight in your room and makes annoying mirror cleaning easy. Due to the suspension on a strap, you can easily take off the mirror. The need to reaching up and stretching is outdated. Bed room / Dressing room: Where do you check the outfit for the day? That's right, in front of the bedroom mirror. That’s why it’s also important that it has a sufficient size to mirror your entire length. The Georg lean-on mirror by Skagerak has a high-quality wooden frame made of oak. Thanks to its slim rectangular shape, it can be placed in any room. Whether antique, oval, or modern, no matter which mirror design you prefer: If you would like to buy your design mirror online, you’re at the right address. Let us send you your favorite one to your home, comfortably within a few working days!